Cooking has been a bit difficult lately, especially on a weeknight. I usually get home from work around 5:00, which means that I only have a few hours to play with Julia since her bedtime is 7:30. It also means that I do not want to spend very much time in the kitchen cooking. So I have been searching for quick recipes… I have found a few good ones. Soup is a good weeknight meal. It usually makes a bunch, which means that you can have it a couple of times during the week. I have been loving this Leek Soup with Dill Oil, which I found on the 101 Cookbooks site. I have altered it a bit… I do not use any butter, I use an extra potato, I leave it chunky, and I do not add any of the items that she suggests (although they would probably be good to add). I have made it numerous times and it’s definitely a keeper. I usually serve it with a pressed sandwich, leftover pizza, or just a few slices of bread. Another recipe that is one of my cooking staples is the Matchstick Pasta recipe, which I also found on the 101 Cookbooks site. This is by far the easiest dish to make! During one of my shopping outings I could not find any pomegranate seeds. I was so upset since I was really craving the dish. 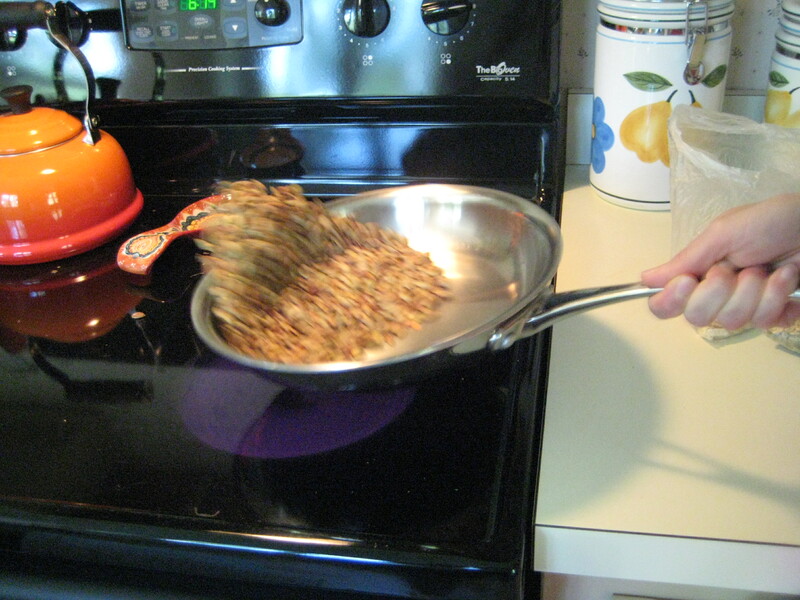 I decided to try dried cranberries as a substitute… it worked great! Pizza is another staple… I find myself making it every week. I usually use Bobolis for the crust, which makes it easy. My favorite toppings are pesto, prosciutto, spinach, and goat cheese. A while ago I found this really delicious pepperoni by Applegate Farms, so I decided to try a peperoni pizza. I used tomato sauce, mozzarella, green peppers, mushrooms, peperoni, and a few thinly sliced onion pieces. It was so good! It is now part of my pizza cycle. In my recent issue of the Whole Living magazine, I discovered a nice quick dish. You simply sautée some garlic with a few sprinkles of pepper flakes, then you add some chopped kale, and sautée it until wilted and cooked through. Lastly, you add some peas and cook them for a bit. Once done, you serve it with some cooked rice and topped with an over-easy egg. It’s so quick and delicious! Another dish that I would like to mention is the Peanut Sesame Noodles, which I found on the Smitten Kitchen site. I made this dish recently and I was surprised how easy it was to make. I wondered why I do not make it more often. I did modify it a bit. I do not make the sauce in a food processor. I simply whisk it and it works just as well. I do not use tofu… I have topped it with cooked chicken (usually the rotisserie chicken from Wegmans) and shrimp. I hope that a few of these dishes will become some of your favorite weeknight meals! 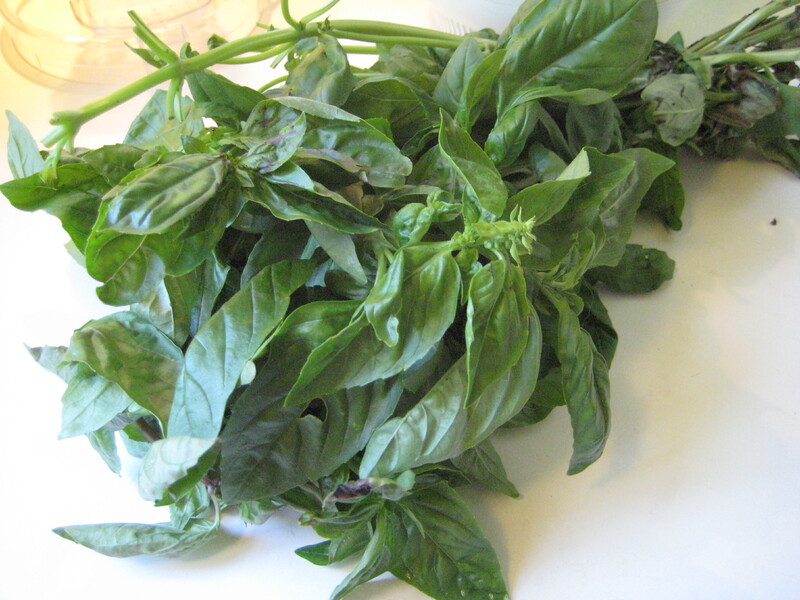 As I wandered around the downtown public market last Saturday, I stumbled upon the most beautiful bunch of basil. “Ooo… I can make pesto!”, I told my friend Kathy who joined me for the market outing. Pestos are some of my favorite dishes to make. They are super simple, and the result is just delicious. Also, each batch usually makes a fair amount, so you can use it for multiple dishes. It also freezes really well. My all time favorite pesto is an arugula pesto. My friend Bruce brought me an amazing cookbook from a restaurant that I hope to visit one day. It’s my dream. The restaurant is called Hell’s Backbone Grill and is located in Utah. The restaurant grows all of their vegetables onsite and seeks all of their meats and dairy from local farmers. How amazing is that!! And to add to that, the restaurant is owned by two women. Even more amazing!! :) The cookbook is called With a Measure of Grace: The Story and Recipes of a Small Town Restaurant. 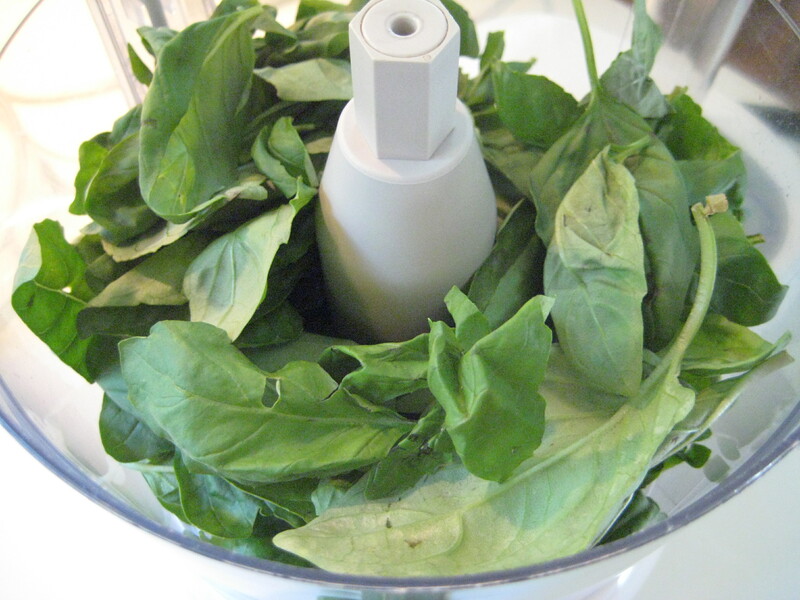 I never thought about making pesto with arugula, but it was just delicious! 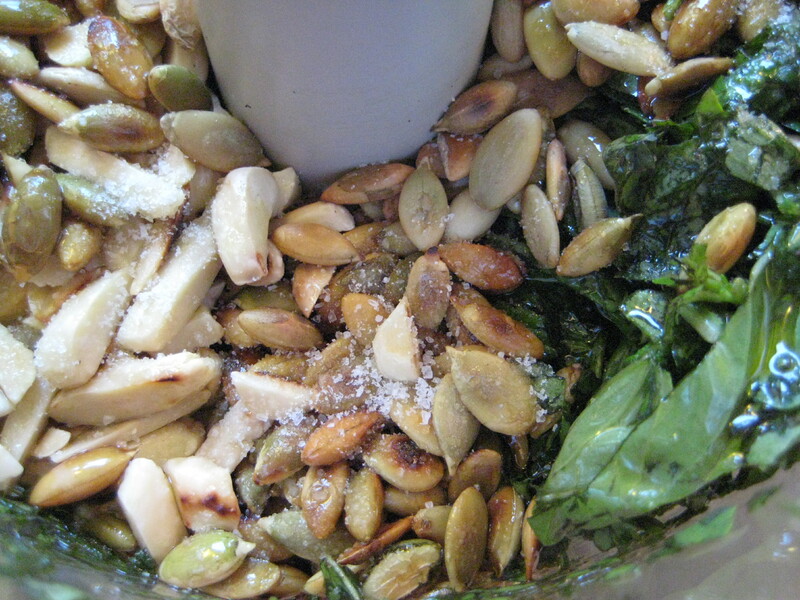 The pesto includes arugula, spinach, pine nuts, pumpkin seeds, olive oil, and salt and pepper. That’s it. It is definitely a favorite. Another favorite is the pistachio pesto, which is used in the Matchstick Pasta recipe from 101 Cookbooks. I have written about the recipe not too long ago (Matchstick Pasta post). That particular pesto does not require any greens, but it is just as delicious. 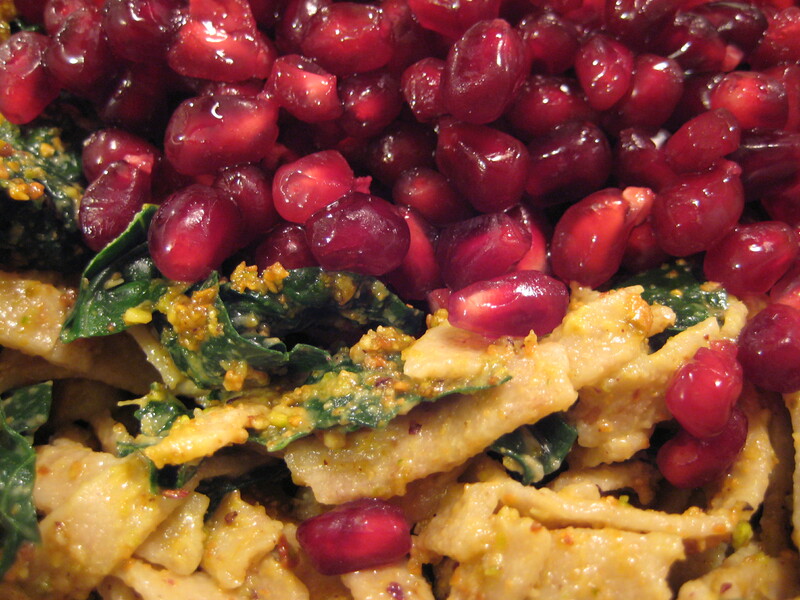 Throughout the years, I have experimented with different nuts and greens. 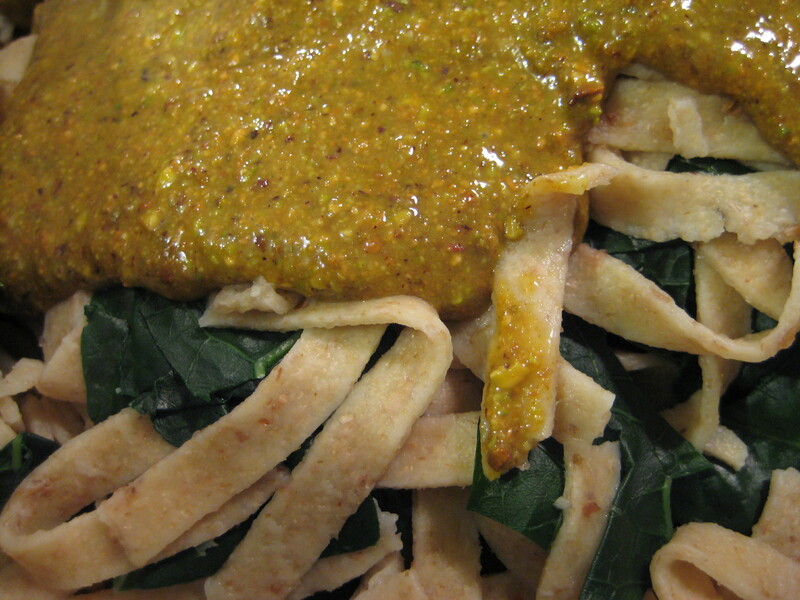 The different nuts are what make the pesto more interesting, perhaps more so than the greens. You can use any nut, really. 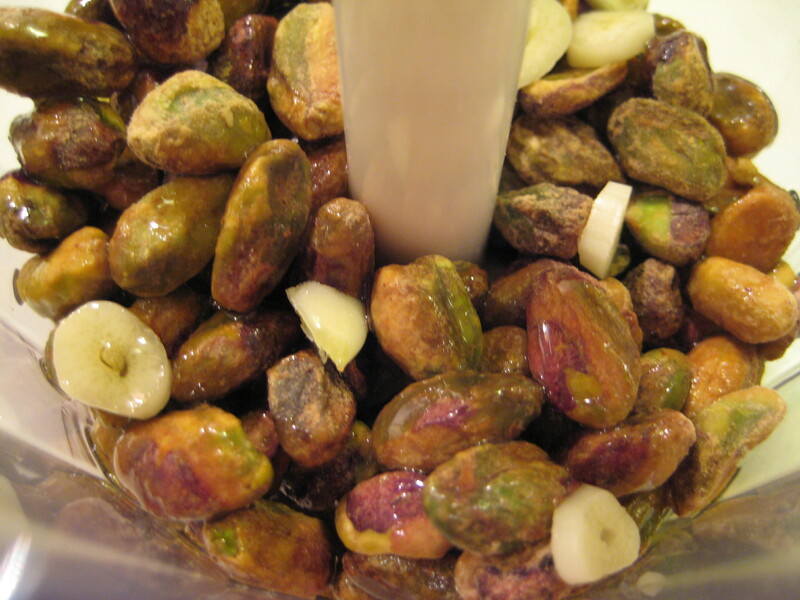 I have tried walnuts, pine nuts, almonds, pumpkin seeds, macadamia nuts, pistachios, and pecans. The possibilities are endless! Also, due to my lactose intolerance, I no longer include cheese in my pestos. I really do not miss it at all. I think that they are just as good without it. Back to the beautiful bunch of basil… For this particular pesto, I decided to use basil, pumpkin seeds, almonds, and of course olive oil and salt and pepper. I believe that a key enhancement to any pesto is to toast the nuts that you are using. It really brings out the flavors. 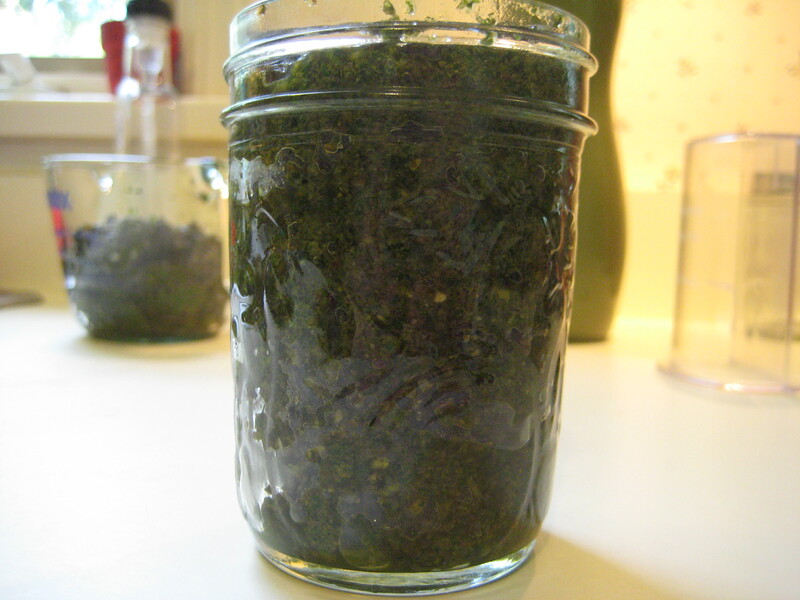 I also do not like my pesto very oily, so I usually do not use the typical amount of oil. I use just enough to hold it all together. 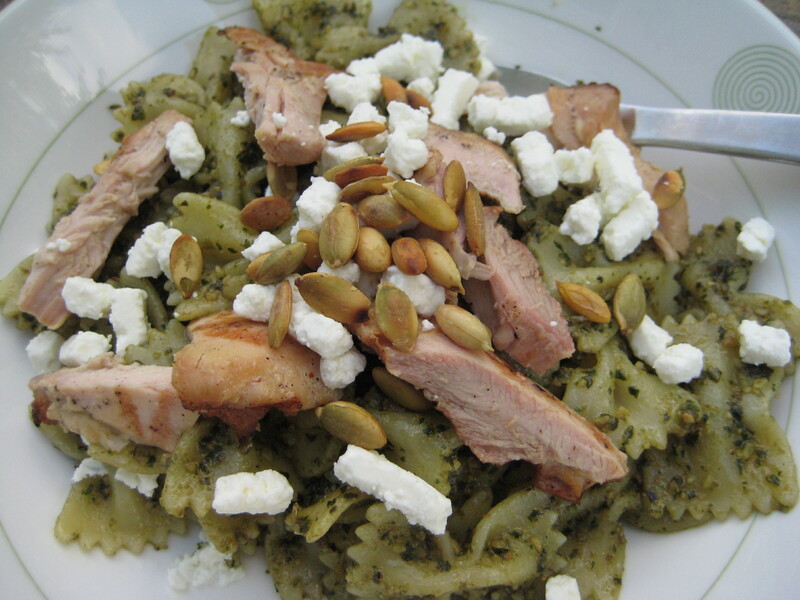 The pesto made a great sauce for a pasta that was topped with grilled chicken and goat cheese. We savored every bite! I was lucky to find more basil and a bunch of arugula at the market this week. I foresee more pesto in the near future! I have been uninspired to cook lately. I know… again. :( What can I say… I am ready for summer. I am ready to give up the stove and oven for the grill. Grilled veggies, grilled veggie burgers, grilled sausages, grilled anything… who would not want to give up the stove and oven for that? A few weeks ago, I came across the Quesadillas recipe on 101 Cookbooks. Heidi promised that it would take me only 5 minutes to make the dish. “Perfect!”, I thought. The recipe is super simple. 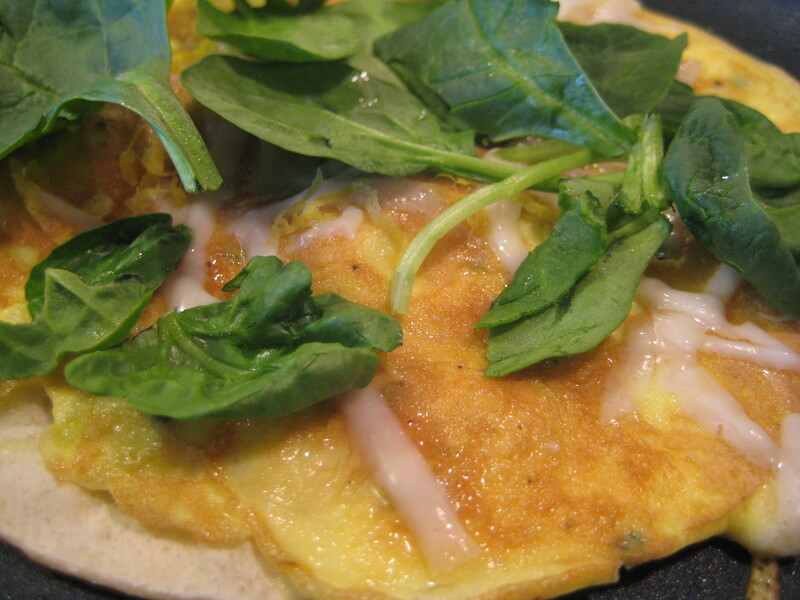 It only requires eggs, corn tortillas, capers, grated cheese, lemon zest, chives, and yogurt. I modified the recipe a bit, since I did not want to use the yogurt. I sandwiched the chives between the egg and the tortilla. 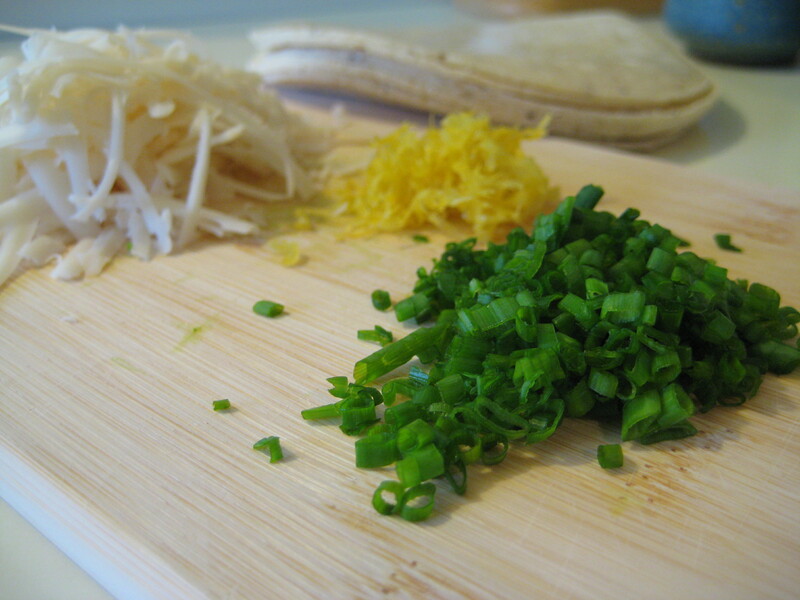 Also, before folding the quesadilla, I added the grated cheese, the lemon zest, and a few fresh spinach leaves. Since I did not use yogurt, I decided to top the quesadillas with some fresh avocado, the fried capers, and some sprinkles of chives. It was delicious!! 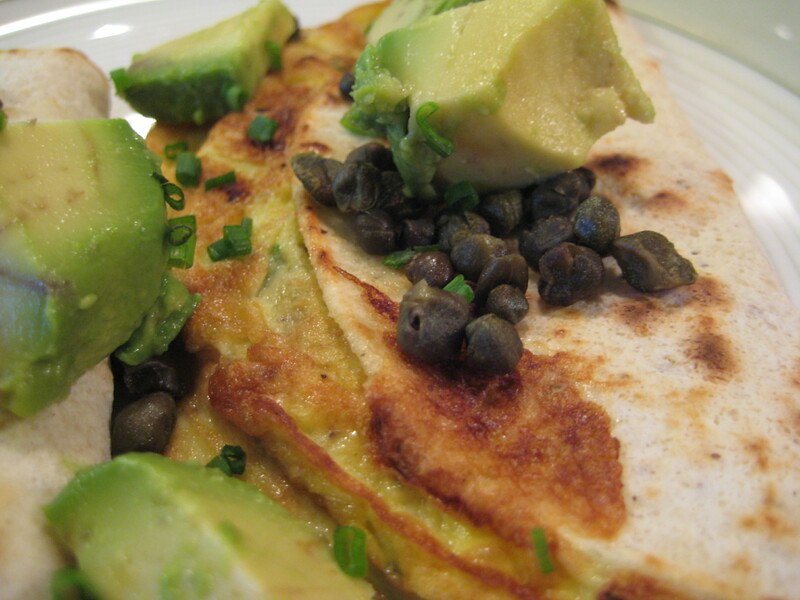 Also, the fried capers really made the dish, so if you make the quesadillas, do not skimp on the capers! Ok, so the dish did not take 5 minutes to make, since I made 5 quesadillas. Having only 1 quesadilla for dinner would have left me, and especially Joel, starving. It is an easy recipe though, and it will definitely be part of my dinner menu rotation. I have not been cooking anything too elaborate lately. I have been sticking to my trusted simple dishes. One of my favorite dishes in the world (yes… I said in the world!) is the Matchstick Pasta. I found the dish a long time ago on the 101 Cookbooks site, and have been making it fairly regularly. It is super simple and amazingly delicious. I am not kidding! I have made it for a fair amount of people and all of them have fallen in love with it. 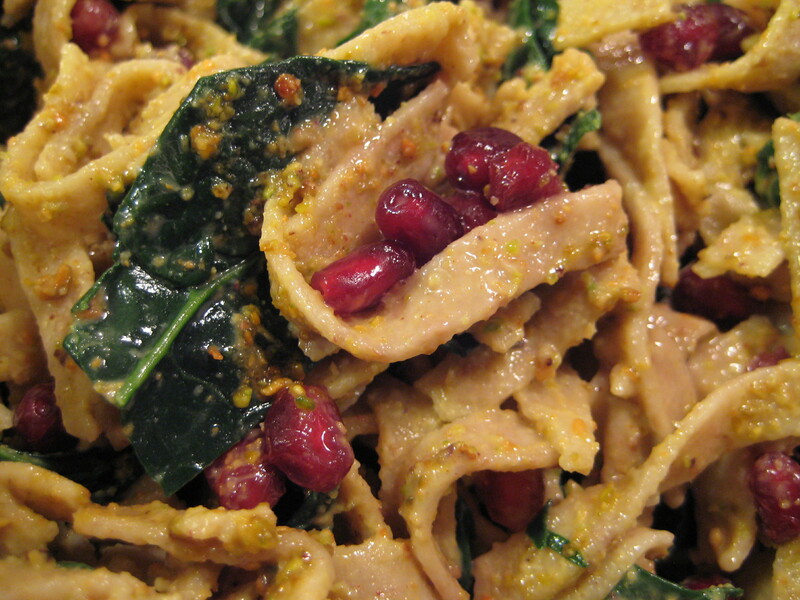 The recipe includes a pistachio pesto, kale, pomegranate seeds, and pasta. That’s it! 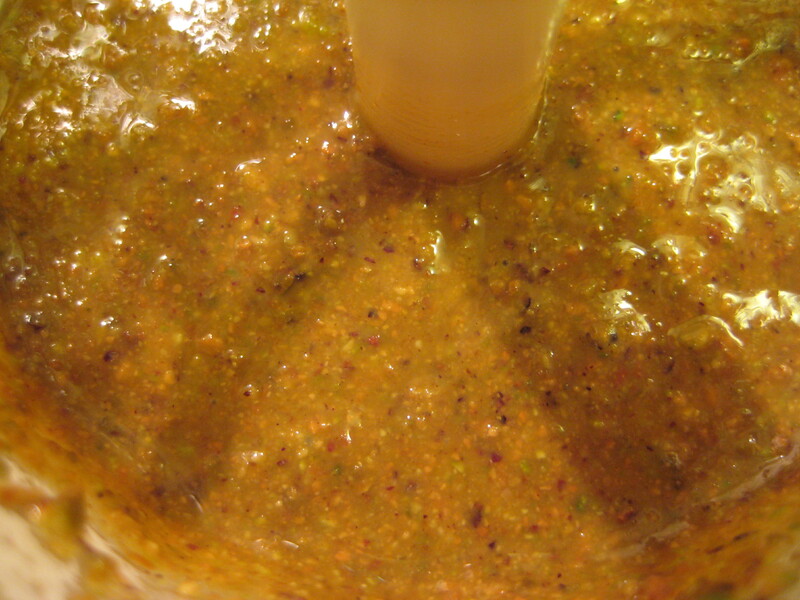 The pistachio pesto is very simple to make. Simply add a cup or so of pistachios, some olive oil, and a garlic clove in a food processor, whirl it around until it resembles pesto, and voilà… you have pistachio pesto! I feel very lucky to be able to purchase pomegranate seeds. I am not a big fan of separating the seeds from a whole pomegranate. It is very messy, and the utensils as well as your hands turn red. 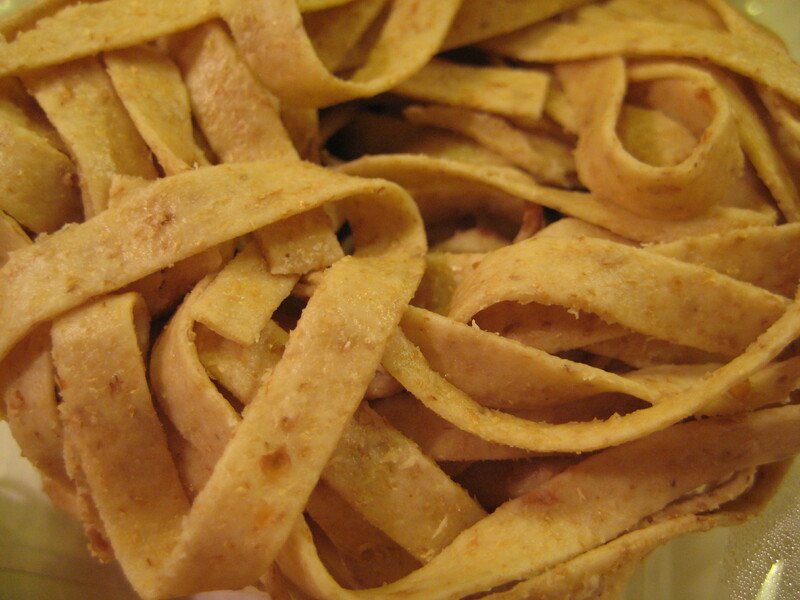 My favorite pasta for this dish is the fresh whole-wheat fettuccine. The pasta gives the dish a nutty flavor, which I love. Regular pasta, however, works just as well.